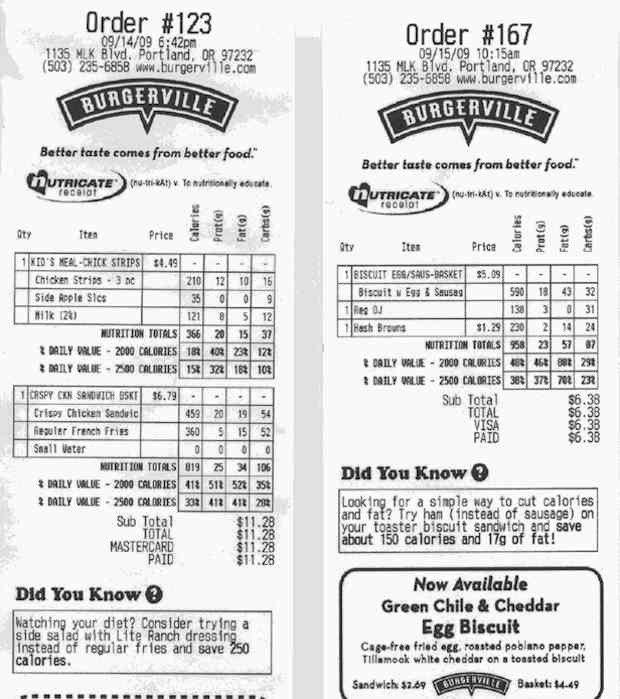 Burgerville Offers Personalized Calorie Counts on Receipts, You Want Thighs With That? out to all 39 Burgerville locations this week. But does it go too far? calorie count could be as high as 800 calories. So guests will get a recommendation saying, for example, if you like the blueberry shake, you might consider getting a blueberry smoothie next time,” Harvey says. The program makes sense for customers on a diet, but we have to wonder if it feeds just a little bit too much into our ever-growing obsession with calories. Burgerville customers can at least rest easy knowing that their high-calorie food isn’t coming from factory farms. But if it catches on, the program could set a questionable precedent. New York City already requires chains to provide calorie data on their menus, so it’s not a stretch to think that a calorie-counting receipt system might be implemented at some point in the future. don’t recall getting any negative feedback,” Harvey says.